Many buildings have poor cellular coverage or dead zones indoors, which is an issue for occupants considering that 80% of calls are made indoors. There are many factors that inhibit cellular signals, such as the size and construction of the building, environmental obstacles, and the location of towers. The number of users on a network (also known as “loading”) can also affect cellular coverage since networks are dynamic and grow or shrink based on inter-cell interference levels. This is why coverage may vary between time of day, or day of the week. Cellular service is increasingly mission critical. Inside hotels, apartment complexes, school campuses, government facilities, or office buildings, poor coverage is not only inconvenient, it is a source of real frustration and concern for employees and/or guests. The key to addressing these issues lies with selecting the best technology. Cel-Fi QUATRA, an active DAS hybrid, disrupted the in-building cellular coverage landscape for the middleprise when it was launched last year because it delivers intelligence and active antennas not found in a typical passive DAS. QUATRA features the power of an active DAS at a price point that supports the middleprise. Cel-Fi QUATRA is a hybrid solution that combines the strengths of both passive and active DAS architectures. It can be deployed as a typical active DAS-style solution, using either a small cell donor or an off-air donor signal. 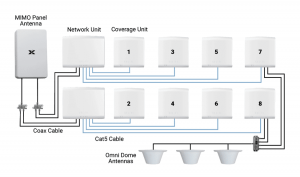 QUATRA’s remote units, called Coverage Units (CU), are active omni-directional antennas and use Power over Ethernet (PoE) to simplify installation. When a building’s layout could be better serviced by an array of focused, targeted antennas, Cel-Fi QUATRA can be deployed like a passive DAS. CUs can be deployed like bi-directional amplifier (BDA)-style remotes used to drive passive DAS branches. This deployment option is particularly well suited for environments with irregular shapes where the RF coverage needs to be shaped to match the building geometry. Cel-Fi QUATRA can be configured with an off-air donor signal, as in the diagram above, or it can be integrated with a carrier small cell for the donor signal, creating a Supercell. The solution above shows Coverage Units 1 to 6 being used as active antennas, with 7 to 8 driving a Passive DAS branch. A passive DAS powered by a BDA is commonly regarded as the most cost-effective way to deploy in-building cellular coverage for the middleprise. However, traditional passive systems using existing technologies have a variety of complexities and complications that can restrict performance. Installers prefer the simplicity of the active DAS hybrid installation. As can be seen in the chart below, there are a number of important differences between a Cel-Fi QUATRA and a BDA-based passive DAS. For any given coverage problem, there is typically a variety of solution options, each with different capital, installation, and operational requirements. Below is a side-by-side comparison of a Cel-Fi QUATRA and a BDA-based passive DAS. A BDA-based passive DAS is greatly impacted by the quality of the donor signal at the site. In poor signal conditions, more equipment is needed. In contrast, QUATRA has enough gain to overcome poor signal conditions (as long as there is some signal), and therefore the capital requirements are easier to predict. Different coverage needs, signal source availability, and building layouts will drive the requirement for a particular solution and deployment model. Cel-Fi QUATRA provides the flexibility to support a variety of configurations to meet the needs of every middleprise building. In an open setting, with high ceilings and low (or non-existent) interior walls, a single high-power, centrally positioned Cel-Fi QUATRA CU can provide coverage to a very large area. This is the simplest and fastest way to install a coverage node, as the units can be quickly mounted, and Cat 5e cable plugged-in to provide power and signal. But in an area with many obstacles or other blockers to interior coverage propagation, an installer may want to pinpoint coverage with easy-to-deploy and inexpensive passive antennas, rather than multiple CUs. In this case, the Cel-Fi QUATRA CU can be used as the remote source to power and drive a passive DAS. Coax cable can be run from the CU’s external antenna ports to antennas to distribute coverage. This configuration maintains QUATRA’s unique advantage of amplifying each carrier independently up to 100 db, instead of the traditional passive DAS application of one gain value to all operators. In addition to QUATRA’s higher-gain, each of the four internal amplifiers are automatically gain-controlled independently, allowing each band to get to maximum downlink power, regardless of input signal strength. In poor signal conditions, a BDA-based passive DAS struggles to provide a good coverage footprint and user experience. The chart below illustrates how input signal strength effects coverage footprint with each technology. While the hardware cost of deploying passive antennas rather than multiple CUs is considerably lower, the installation is more complicated and therefore requires more planning and RF engineering. Improper installation or set-up can lead to poor or inconsistent results, leading to a bad customer experience. This must be factored in when the system integrator evaluates the right solution for the environment, and works to meet budgetary needs. Cel-Fi QUATRA leverages the Nextivity IntelliBoost™ baseband processor, which is the first six-core processor designed specifically to optimize the indoor transmission and reception of 3G and 4G/LTE wireless signals. With advanced filtering, equalization, and echo-cancellation techniques, the Cel-Fi architecture far surpasses the in-building data rates of a passive DAS. It provides maximum coverage yet does not negatively impact the macro network. When it comes to solving indoor cellular coverage problems, there isn’t a one-size-fits-all solution. However, with the flexibility of configurations, deployment models, and donor source options, Cel-Fi QUATRA offers the savvy system integrator a solution that out-performs a passive DAS every time. Even in venues where no signal penetrates into the building, QUATRA can still solve the problem by integrating with a carrier small cell for the donor signal to create a Supercell. Plus, it can be tailored to the coverage needs of most middleprise venues at a competitive price that fits within their budget requirements. Cel-Fi QUATRA delivers high quality in-building cellar coverage for the middleprise, defined as venues ranging from 50,000 to 500,000 sq. ft in size. QUATRA combines the best of active DAS and Cel-Fi technology that has been widely adopted by carriers around the world, delivering a scalable solution that provides configurations for single or multi-carrier environments. Options are available for off-air mode or via integration with carrier small cell equipment where it is operated in distributed small cell mode to create a Supercell. Supercells provide uniform access to the capacity introduced by the small cell and are preferred by carriers in densely populated and high traffic areas. Click here for insights on Supercell implementations. Cel-Fi QUATRA is self-configuring and self-optimizing, distributes RF over Ethernet (RFoE), and leverages PoE for ease and accuracy of installation by Cel-Fi Certified professionals. Nextivity offers a remote management platform called Cel-Fi WAVE to all partners and customers, so installs can be monitored and managed. The WAVE platform is enabling new business models in the channel, facilitating Service Level Agreements (SLA) not previously possible. Click here to watch a video and download the case study that showcases a hybrid installation in a New York food hall that needed help with cellular coverage.